This article may contain outdated information that is inaccurate for the current version of the game. It was last updated for 1.26. The regional divisions of the South of the African super-region. The Southern African regions are part of the Africa super-region. The nations in these regions are mainly divided into 2 main separate areas, the central inner lands and the eastern coast and the island, allowing nations in each area to try and become a local power uninterrupted before dealing with any other threat. This is especially true for inner Africa which can remain untouched by Europe well into the mid-late game. Since Fetishism is the dominant religion in these parts, nations from one main area quick to interact with nations from the other main area will be able to double their available cults and get a bit of an advantage over their immediate neighbors. 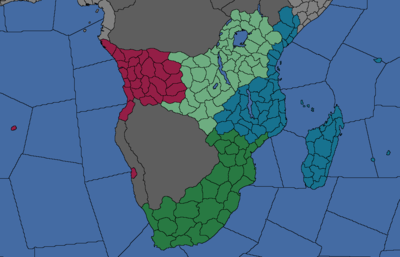 There are many uncolonized provinces along the southern coast for outside forces - such as the European powers - to use as a stepping stone to get to Asia before turning the focus onto Africa itself. There are also uncolonized provinces acting as a divider between the aforementioned main areas which can be colonized, although it would be done at a rather great cost due to high native aggressiveness and ferocity. Controlling the trade nodes in the inner regions ensures the flow of money into Europe from its African holdings. Getting a hold of the eastern coast lines and diverting the trade coming from India will also help in obtaining the rich Asian trade. Tribal government forms are the dominant type in these parts (split mostly between Tribal Monarchy and Tribal Despotism). Fetishist is the dominant religion in these parts at the 1444 start. Sunni is present in the eastern part (with a bit of Ibadi). Central African is the dominant tech group in these parts. Great Lakes in the northern part. Congo in the western and central parts. East Bantu and Southern African in the eastern part. There are no (re)formable nations in this super-region. There are no revolter nations in this super-region. For countries in the Great Lakes culture group. For countries in the Congo culture group. For Nyasa and Makua countries. For Kongo, Loango and Ndongo. This page was last edited on 20 September 2018, at 06:39.